Does anyone remember sandcastle flags? When visiting the beach, there were several shops on the beach front selling buckets spades and of course the set of flags. Normally the sandcastle flags came in a set of six. 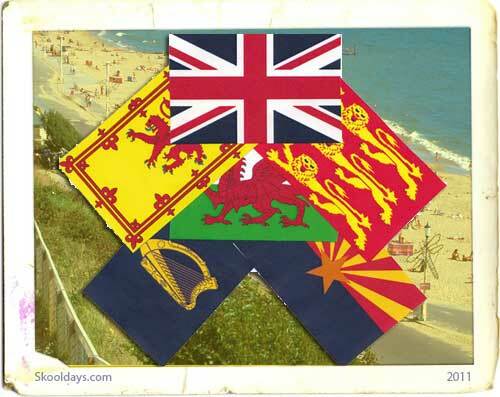 Today we discover why were these flags of a certain design in the Uk. Maybe your flags that you purchased were different. Let us know what flags you remember in the comments below. Sandcastle flags – One weird flag included? No doubt it was a very patriotic assortment. Leaving on unaswered question regarding the state flag of Arizona. anyone have any ideas why this flag was added to the collection? Of course the fun of visiting the beach didnt stop while you were at the beach. Oh no, days later you would still find grains of sand in your bed from the visit, weird that but i’m sure others experienced the beach visit and had the same. Sand castles are typically made by children, simply for the fun of it, but there are also sand sculpture contests for adults that involve large, complex constructions. Some of these kids must of grown up into the Sand Art guys you still see on Weymouth beach in the south of England. The saddest thing is they spend hours creating the most amazing sculptures from sand and then just watch the tied come in and wash it away. Not sure if i could handle the loss so quickly after all those hours work on the beach. Even though you see less of the flags on beaches these days i did see some for sale the other day. The pack of six vintage seaside sand castle flags included two Union Jack Flags, two black pirate skull and crossbones flags and two Lion “King of the castle” flags. Tell us your experiences of a visit to the beach for you? what sandcastle flags did you buy? This entry was posted in Pop Culture, Toys and tagged 1900, 1910, 1920, 1930, 1940, 1960, 1970, 1980, 1990 by Skooldays. Bookmark the permalink. I’m sitting here watching the cricket: Sri Lanka vs England. Made me think about the fabulous Sri Lankan flag – and I’m sure the Sri Lankan flag was part of the pack – thoughts? I believe the Sri Lankan flag was.